The Field Gun Run is a competition that commemorates the Royal Navy’s involvement in the relief of Ladysmith during the Boer War in 1900. The field gun run is divided into three sections. The first section is called the run out. The guns are raced from the start position down the sides of an arena and manhandled over a five foot wall. Wooden spars weighing 170lb are erected and a flying fox rigged across an area of 28 feet representing a hitherto impassable chasm. The first men are hauled across, carrying 120lb wheels for the gun carriage. The gun carriage and gun barrels follow, the gun barrels each weighing 900lb. The remainder of the gun carriages’ wheels and limbers are pulled through a hole in a second enemy wall. Each gun crew then engages the enemy, firing three rounds. The second section of the event is the ‘run back’. All the men and the field gun have to be carried over the enemy wall, and back across the chasm. The combined weight of the gun barrel and gun carriage is 1250lb; and it goes over the wall in one piece. As soon as the last man of each gun’s crew - nicknamed 'the flying angel' - is across the chasm, the rig is collapsed, and three rounds are fired in a rearguard action. The third and final section is called the 'run home'. At the sounding of the musical note ‘G’ on a bugle the final phase begins involving the return of all equipment through narrow gaps in the home wall. In a matter of seconds the wheels are on, pins are in, and the gun crews race flat out to the finishing line. The average time for the run out is one minute twenty five seconds; for the run back one minute and for the run home 21 seconds. All three stages are carefully timed and these are added later to the crew’s actual running time to give the official time for each crew. Each crew competes seven times against each of the other crews. Only two crews run during each heat. A four minute run was first recorded in 1948, and a three minute run in 1962. Nowadays runs in less than three minutes are commonplace. The last competition in this form took place in 1999. The Field Gun Run is still re-enacted in some degree by enthusiasts of the sport and public demonstrations and competitions held. Displays, modelled on the Royal Navy’s Field Gun Run, have at times been performed by the Royal Australian Navy. Like Britain’s sons, they’ve fought their guns, and avenged Majuba Hill. The second Boer War began on 11 October 1899 when the Dutch-descended Boers of the Transvaal and Orange Free State declared war on the British colonial forces of South Africa. Shortly after the declaration of war, the British commanding officer of the Ladysmith garrison, near the Natal/Transvaal border, Lieutenant-General Sir George White, VC, seeing the extent of the Boers’ artillery slowly advancing on Ladysmith, called for naval guns with sufficient range to be brought up urgently. While guns from Terrible and Powerful were available, there was no suitable mounting for their use on land. Fortuitously, Terrible’s captain, Captain Percy Scott, RN, was a gunnery specialist with more than 20 years' experience. Overnight, using only what was available in the dockyard at Simonstown, Scott drew up plans for the mountings and within 48 hours had overseen the fabrication of mobile carriages for 4.7-inch guns in the dockyard workshops. Within a further 24 hour period mountings for the long naval 12-pounders were also fashioned There was some scepticism about whether the mountings would survive the stress of the guns when fired but trials proved Scott’s designs; the 4.7-inch and the 12-pounder fired projectiles to 12,000 and 9000 yards respectively. Further mountings were ordered immediately and a naval brigade made up of sailors and marines from the small British fleet in Simonstown began practicing with the guns on 17, 18 and 19 October. Powerful, with guns and brigade embarked, arrived in Durban on 28 October. The following day, the brigade, navy whites substituted for khaki, numbering some 284 officers and men under the command of Powerful’s captain, Captain Hedworth Lambton, RAN, left Durban by rail for Ladysmith. They took with them two 4.7-inch guns, four long-range 12-pounders, four Maxim guns and ammunition. Their train was the last to complete the journey to Ladysmith on 30 October just as the Boer siege started. The guns were unloaded at Ladysmith under fire from the Boers, loaded onto wagons and hauled into place by oxen, and immediately began to answer the Boer fire. The naval brigade had arrived at Ladysmith just in the nick of time, and the guns proved an effective defence against the Boer artillery being the only British artillery with the range to engage the Boers’ heaviest pieces, however, they could not prevent the siege of Ladysmith and by 3 November, the town was encircled. The senior supply officer of the Ladysmith Garrison reported that the 13,500 defenders and 7500 civilians in Ladysmith had enough food to last fifty days, while the animals had enough food for only thirty. Boer forces, under the overall command of General Petrus Joubert, had also besieged the towns of Kimberley and Mafeking. Meanwhile, a second naval brigade, under Commander Alfred Ethelston, RN, had landed at Simonstown before Powerful’s departure for Durban, and had proceeded north to Cape Town. From Cape Town, the brigade travelled by rail to Stormberg Junction and then to Queenstown before returning to Simonstown on 19 November without having fired a shot. However, a new, larger naval brigade was immediately formed under the command of Captain Reginald Prothero, RN and later Captain John Bearcroft, RN, after Prothero was wounded at the Battle of Graspan. This brigade joined other British forces, by rail, at Witteputs and was involved in a number of major battles in the Cape Colony and Orange Free State on its way to breaking the siege of Kimberley in the North Cape. This brigade included the only known member of Australia’s colonial navies to fight in the Boer War. Lieutenant Commander William Colquhoun of the Victorian naval forces accompanied the Victorian army contingent to South Africa and later joined the brigade at Modder River. He commanded one of the 12-pounder gun crews during the relief of Kimberley. Finally, Terrible began to disembark a third brigade at Durban on 7 November, under the command of Captain Edward Jones, RN, with the intent of relieving the siege of Ladysmith and pushing the Boers out of Natal altogether. They were armed with two 4.7s and 14 12-pounders, as well as machine guns. The brigade joined a force of some 21,000 men under the command of Lieutenant-General Sir Redvers Buller, and travelled as far north as the rail lines now allowed; just outside Colenso some 20 kilometres south of Ladysmith and at that time, under Boer control. After a disastrous attempt to take Colenso on 15 December, the focus of the British attack shifted. Over the next two months, the naval brigade would drag their guns across the rough bushland of northern Natal, accompanied by a never ending torrent of rain, trying to break through the Boer lines and get to Ladysmith. It is these actions that the Field Gun Run seeks to emulate. One good old navy drag-rope and a hundred horny-handed sailors would - and often did - take a heavy ammunition wagon or 4.7-inch gun where no traction engine under full steam with an open throttle-valve or a prize team of oxen could approach...Moral: drag-ropes, and good long ones. They arrived at Potgieter’s Drift the following day. On 24 January was fought the Battle of Spion Kop, a murderous encounter that ended in stalemate with nearly 600 men killed and over 1000 wounded on both sides in an area not much larger than a football pitch. The British and Boers both retired at the end of the day, battered and exhausted, however, the Boers returned the next day to once again occupy the summit. Buller next turned his attention Vaal Krantz, a series of ridges east of Spion Kop, with the intention of stretching the Boers defensive line and breaking through to Ladysmith. For two nights the naval brigade, assisted by about 100 Scots Fusiliers, hauled eight of the 12-pounders up Zwaart Kop in wet and rough terrain, hiding during the day so as not give away their position, where they were to bombard Vaal Krantz. Many in Buller’s force believed it would be impossible to drag the heavy naval guns up to the summit of Zwaart Kop, the ascent in some places being in the order of 45 degrees and covered with boulders. But after much hauling on the drag ropes resulting in many blistered and bleeding hands, the summit was reached before dawn on 5 February. However, after three days of fighting, the British once again failed to capture their objective and the stalemate continued. Ladysmith was now into its fourth month under siege. The senior supply officer had done an exceptional job keeping the populace fed on rations that he had estimated, at the start of siege, would last for 50 days. However, the situation was becoming desperate. As well as starvation, disease was becoming rampant. Three field hospitals operated in Ladysmith along with another established at Intombi Spruit, in no-man’s land, but they struggled to handle the influx of sick and wounded. The four hospitals treated more than 10,000 cases over the course of the siege, and some 551 people died of disease. Following the failure at Vaal Krantz, Buller sent word to Captain Scott asking if an even bigger 6-inch gun on a carriage may be made available. The carriage was quickly manufactured overnight and, after being tested on the beach at Durban, the 6-inch gun with a total weight of eleven tons was entrained to the front, where it arrived on 12 February, along with a draft of sailors from HMS Terrible to man it. It was subsequently run up ‘Gun Hill’ to the south of Colenso. Buller turned his attention further eastwards where the Tugela River snaked its way northwards and then east through a six mile long gorge behind the Boer forces on the southern bank of the river. On the morning of 14 February, the British seized Hussar Hill, the southernmost of the Boers’ eastern defences, and placed 34 guns, including six naval 12-pounders, on its summit. They quickly established the guns on the hill under increasingly accurate Boer shellfire and began a creeping barrage over the heads of the British infantry advancing north on the Boer forces between Hlangwane and Green Hill. The new 6-inch gun fired its first shots on this day, knocking out Boer guns and a searchlight at a range of some 16,500 yards. Over the next four days, the Boer defences on the southern bank of the Tulega fell to the British. On the evening of 18 February, the naval 12-pounders were hauled down from Hussar Hill to the top of ‘Monte Cristo’, a summit some 300 metres high, from which they could observe Ladysmith and the siege surrounding it. They began a bombardment the following morning before a thunderstorm allowed the Boers to withdraw to safety. They were later joined by the naval 4.7s after hauling the guns more than 15 kilometres over some of the roughest country they had yet encountered. On 19 February Buller’s forces occupied Colenso without a shot being fired and on 22 February, British forces began crossing the river at Colenso via a pontoon. Some of the naval 12-pounders were amongst the first to cross the river, however, the 4.7s, weighing in at nearly six tons, had to be partially dismantled and taken across in stages. The British forces met stiff resistance on the north bank of the river with some 5000 Boer troops and accompanying artillery determined to hold their ground. The next two days, 23 and 24 February, once again saw intense fighting as British forces attempted to follow the north bank of the river eastwards towards the artillery atop Hlangwane and Monte Cristo. But once again their advance was stalled and they were recalled back across the river and the pontoon hurriedly dismantled and shifted downriver towards the supporting artillery. On the morning of 27 February, with the pontoon re-established under the heavy guns, the British again crossed the river and began to advance behind the creeping barrage of the artillery. The naval brigade maintained a constant rate of fire during the day, punctuated by the periodic shell-fire of the big 6-inch artillery piece situated on Gun Hill. The fire of the naval guns here was particularly valuable, their shooting was admirable, and they were able to keep up fire with common shell long after the Royal Field Artillery were obliged to cease their shrapnel. Indeed, Lieutenant Ogilvy, of HM Ship Terrible, kept up fire on the largest sangars [fortifications] till the infantry were within 15 yards of them. His guns must have saved us many casualties. The Boers evacuated their positions overnight and British forces entered Ladysmith on 28 February 1900. After 112 days under siege, Ladysmith had been relieved. The naval brigade component of the relieving force comprised 39 Royal Navy officers and 403 ratings along with three officers and 50 ratings of the Natal Naval Volunteers. They had fired some 4000 rounds of 4.7-inch ammunition and 12,000 rounds from the 12-pounders. 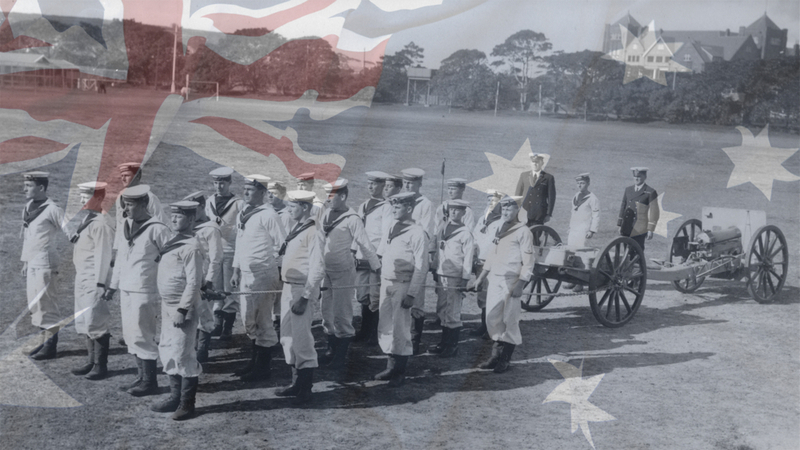 Field gun training was a major part of the training of pre-Federation, colonial naval militias, and the naval component of the Australian Naval and Military Expeditionary Force, the first Australian unit to see action in World War I, were well versed in field gun operations. The field gun run competition first took place at the Royal Tournament of 1907. It is estimated that since its inception some 15,000 men of the Royal Navy have taken part in this physically demanding competition. It has been practised in Australia for almost as long and on special occasions forms part of ceremonial events such as the 1988 Bicentennial Fleet Review. A Field Gun Crew from HMAS Cerberus in training, circa 1937-39. Field gun training at HMAS Cerberus in 1924. The then Chief of Navy, Vice Admiral DJ Shackleton, AO, RAN, returns the salute fired by a field gun crew at ceremonial divisions to mark 80 years of naval training at HMAS Cerberus in 2001. Members of HMAS Albatross' field guns crew 'run out' their gun and limber during the ACT Alive celebration in Canberra in 1996. ↑ Majuba Hill refers to the main decisive battle of the First Boer War fought on 27 February 1881 on the border between Natal and Transvaal where a British force, including a small naval brigade from HMS Dido, commanded by General George Colley was comprehensively defeated by the Boers and Colley killed. The Boer commander was General Petrus Joubert.